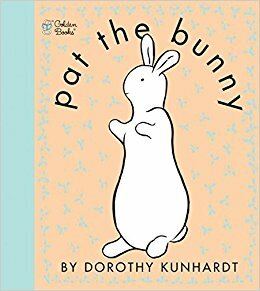 One of my favorite little books that most parents remember from their own childhoods is Pat the Bunny. Written in 1940, it’s certainly a classic (aka OLD), but don’t let its age fool you. Toddlers still enjoy this darling little book IF you use the book as its intended… interactively. Now YOU pat the bunny. (my modification that seems to work best). 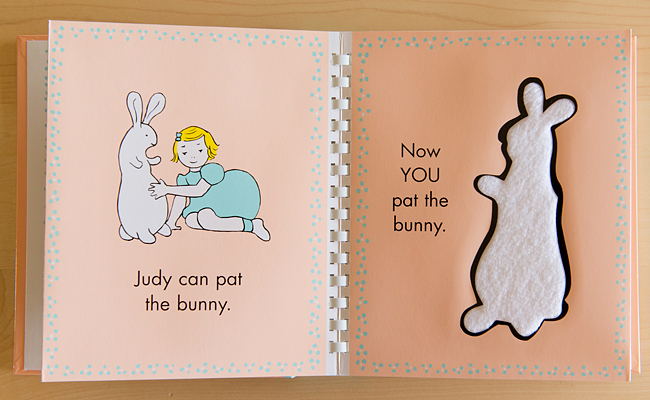 For this reason, Pat the Bunny has become one of my go-to tools for a child who likes to look at books, but doesn’t follow directions or sit through an entire book. The requests in the book are timeless and still pretty functional… even in 2019! I’ve witnessed dozens of toddlers wave bye-bye for the first time after reading this book for a few weeks during our sessions. The social games Peek-a-Boo and So Big are included too and are a great opportunity for helping a child learn to participate during these fun little routines — and for helping parents remember to play these games with their child! 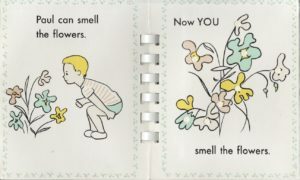 To make this book effective for toddlers, you will need to show them what to do on each page a couple of times and then encourage them to perform the action. If they don’t, help them. Stay upbeat and FUN the entire time, but take their little hands and make them do it in the most cheerful way possible. If you encounter lots of resistance, put the book away and try again at a later, more cooperative time. For parents, this is a great book for snuggle time — after a child has settled in to your lap and he’s less likely to try to get away. 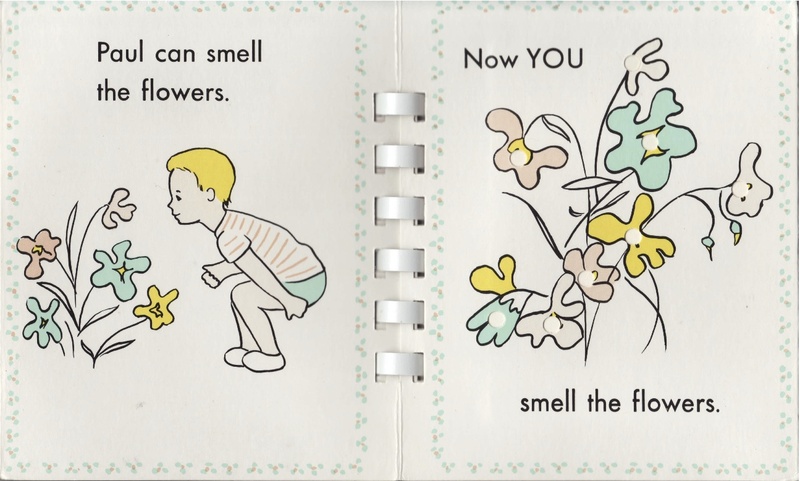 Therapists might use this book after a gross motor activity. I like it during snack time when a child knows he needs to keep sitting in order to get the next treat. Most of the time, I offer the next little piece of whatever he’s eating as soon as he’s completed the action on each page as a “reward” for continuing. I don’t necessarily set it up that way; it’s just becomes a natural part of the activity. Over the years, I’ve helped many kids learn to like tolerate books using food as we read together and many parents have continued this when I’m not there fading the snacks over time once a child learns to sit and stay for the activity. Experiment to find the “just right” speed for reading. Most adults assume that you casually read and complete each action lingering over the page. For some toddlers, that’s too B…O…R…I…N…G. In my experience, most busy toddlers prefer that you amp it up and get through the book pretty quickly. Try it both ways to see what promotes the best attention and response. With the most reluctant book listeners, do a page or two and then move on to something else, but gradually increase additional pages by adding 1 or 2 new pages each time you read (or over a few days or sessions) until the child eventually stays with you for the entire book. Over time, fade your models so that you can see how well a child completes the request as you read each page. This activity can build a foundation for helping a child learn to follow directions making it a great routine for toddlers with receptive language delays. For more tips for reading books and for a list of my favorites for therapy for toddlers, read Great Books for Speech Therapy which also includes a couple of Therapy Tip of the Week videos if that’s your learning style.